For the rich and famous, electronic gadgets cannot be just a common gadgets owned by everybody else, just like owning a Mercedes-Benz car will certainly show your status. So here come premium gadget PDA Smartphone from ASUS, that also has limited release worldwide. The ASUS P526 Mercedes-Benz C-Class Limited edition Smartphone, as you should know now, is built from ASUS P526 Windows Mobile PDA Phone, so it inherits all its features. 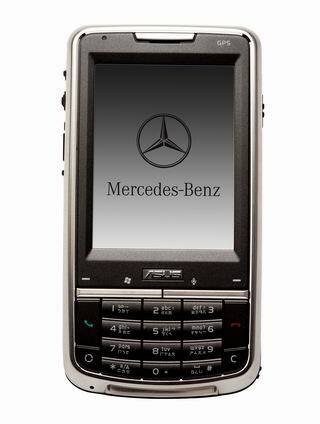 Mercedes-Benz branded ASUS P526 PDA also features Windows Mobile 6, 2.6″ QVGA touchscreen, 128MB ROM, 64MB RAM, an alphanumeric keypad, built-in SiRF StarIII GPS Chipset with TomTom GPS navigation system, a 2 megapixel camera, Micro-SD expansion slot, Bluetooth, WiFi, supports quad-band GSM/GPRS/EDGE, and has dimensions of 110×58×15.4 mm and weight of 115 g. Full specifications below. 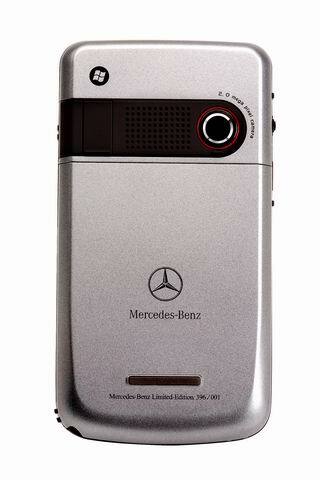 What makes it to be a premium Mercedes-Benz phone is that the PDA has Mercedes-Benz logo on the body casing, built-in Mercedes-Benz start and shutdown logo, new C-Class wallpaper and screensaver, GPS navigation system showing Mercedes-Benz showroom location by default, and also you get another Mercedes-Benz logo on your warranty card metallic sticker, been crafted with laser. The whole phone certainly looks very elegant and luxury, just like the car. 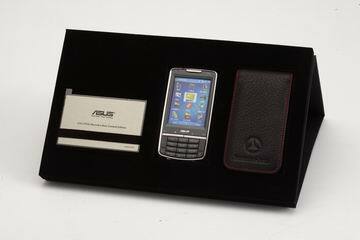 ASUS P526 Mercedes-Benz Limited Edition Smartphone has limited circulation of just 699 units worldwide. Of those, 399 units come with additional specially designed Mercedes-Benz gift box with a genuine leather case inside. And it’s free, however, it’s only given free to the buyer of the new Mercedes-Benz C Class series luxury car. You may try your luck on the next 300 units without gift box, though Mercedes-Benz is yet to decide whether to give away it or sell it to their customers.